Watch the Big Game at Cabo Wabo Cantina inside Miracle Mile Shops at Planet Hollywood at their rockin’ viewing party complete with food and drink specials on Sunday, Feb. 2. The hottest Strip-side cantina will offer an all-you-can-eat-and-drink football buffet, priced at $200 per person. Fans may enjoy traditional favorites including: hot dogs, sliders and a build-your-own tacos and nachos station. Thirsty patrons may also enjoy buckets of Budweiser and Bud Light with their meal. Guests will feel like they are on the sidelines watching all of the action on high-definition TVs, available throughout the cantina. Sammy Hagar’s hard rockin’ dining and live music venue combines the laid-back beach-town vibe of Cabo San Lucas, Mexico, with the excitement of the Las Vegas Strip. Blending coastal Mexican and Tex Mex cuisine, the menu offers a tantalizing mix of flavorful food, killer margaritas and an awesome venue where it is never uncommon to catch the Red Rocker himself jamming out with a live set on stage. Cabo Wabo Cantina opens daily at 8 a.m. More information about Cabo Wabo Cantina is available at www.cabowabocantina.com, by calling 702.385.2226, by following Cabo Wabo on Twitter and liking Cabo Wabo on Facebook. 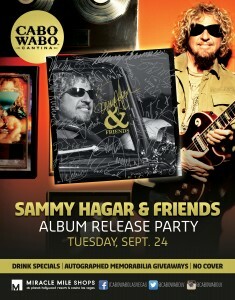 For more information about Hagar and his famous Cabo Wabo Tequila, guests may visit www.redrocker.com and www.cabowabo.com. 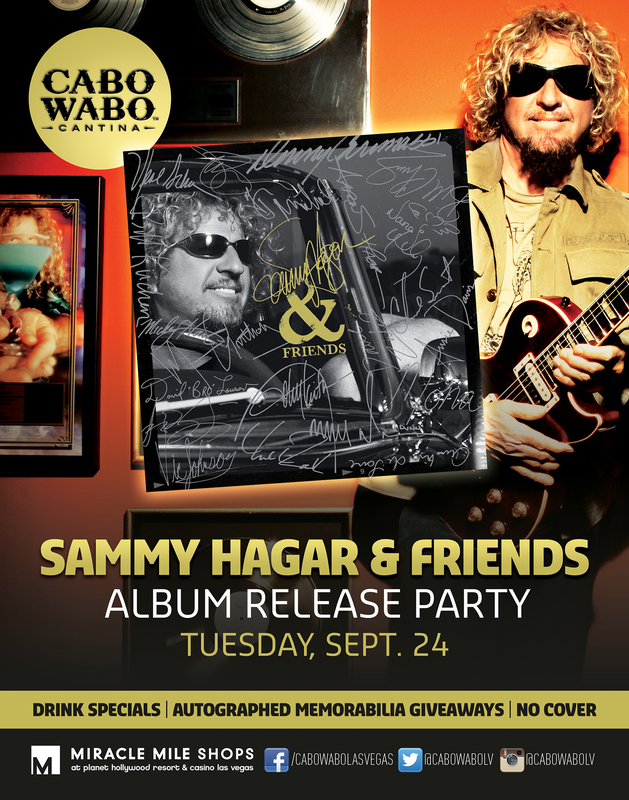 Cabo Wabo Cantina inside the Miracle Mile Shops at Planet Hollywood invites rockers and red heads to celebrate the release of Sammy Hagar’s new LP “Sammy Hagar & Friends” with drink specials and autographed memorabilia giveaways on Tuesday, Sept. 24. Red Rocker followers will join the fun and festivities of the album release party at Hagar’s rockin’ cantina with $10 Sammy’s Red Head Mai Tais made with macadamia infused Sammy’s Beach Bar Rum, Orgeat, tropical juices, fresh lime juice and topped with a drizzle of Sammy’s Red Head Beach Bar Rum. During the party, the Strip-side venue will give away autographed memorabilia while guests rock out to “Sammy Hagar & Friends” throughout the day. Hagar fans will also watch a “behind the scenes” viewing of the making of the album on the venues multiple high definition televisions and jam to live music by The Busker Kings at 8 p.m.
feat from such a great band! 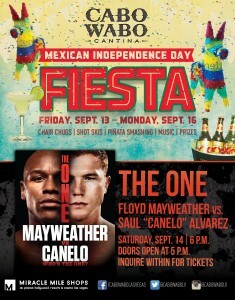 Cabo Wabo Cantina will throw a weekend-long fiesta in honor of Mexican Independence Day from Friday, Sept. 13 through Monday, Sept. 16. Partygoers will experience a jam-packed weekend of fiestas and fights at the rockin’ cantina when chair chugs, shot skis, wheel spins and piñata smashings invade the venue’s Strip-side patio. 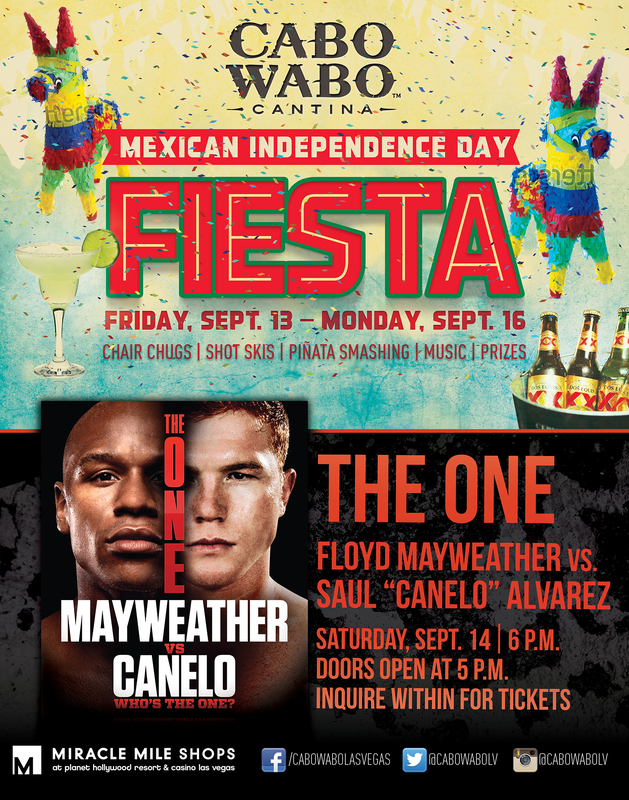 Celebrators that purchase a bottle of Dos Equis or Cazadores shot will be granted the opportunity to take a swing at one of several festive piñatas filled with candy, T-shirts and Cabo Wabo merchandise. Guests will enjoy $19 buckets of Dos Equis while they win more prizes from the Dos Equis, Cazadores and Cabo Wabo models. Cabo Wabo Cantina located inside Miracle Mile Shops at Planet Hollywood Resort & Casino will wrap up summer with a weekend-long party starting on Friday, Aug. 31 through Monday, Sept. 2. Beginning Friday at noon, Sammy Hagar’s rockin’ cantina will transform into the ultimate Labor Day Weekend celebration with KOMP 92.3 F.M. radio station. Revelers will throw back beer after beer by indulging in $19 buckets of ice-cold Dos Equis during the last official weekend of summer. To keep the four-day fiesta flowing, guests will win prizes from the Dos Equis, Malibu Rum and Cabo Wabo models throughout the weekend. Cabo Wabo Cantina inside Miracle Mile Shops at Planet Hollywood Resort & Casino welcomed summer with a “Beers & Bikinis” kickoff party and keeps the fun going every weekend starting at 8 a.m. on Fridays. Ladies can head straight from the pool to the Strip-side patio to enjoy their first cocktail free by donning their bikini tops. Cocktail selections include the refreshing Strawberry Margarita, made with Cabo Wabo Tequila Blanco, orange liqueur, strawberry puree and lime juice; and Maui Rocker, blending Sammy’s Beach Bar Rum, orange curaçao, pineapple juice, grenadine and sour mix. All patrons can keep their cool with $25 Dos Equis buckets, and nosh on Cabo Wabo’s savory Baja-Mex fare. Cabo Wabo Cantina inside Miracle Mile Shops at Planet Hollywood Resort & Casino rocks out with live music by acoustic power trio, The Busker Kings, Tuesday through Thursday from 8 p.m. – midnight. Comprised of Shawn Eiferman on guitar and vocals, Ryan Whyte Maloney on guitar and vocals and Beau Doyle on percussion and vocals, The Busker Kings will engage crowds on Cabo Wabo Cantina’s Strip-side patio with original songs, as well as a variety of covers including rock, country, pop, reggae and blues. Patrons can enjoy the entertainment while savoring killer margaritas created with Cabo Wabo Tequila, refreshing cocktails made with Sammy’s Beach Bar Rum and Cabo Wabo’s signature Baja Mex. Live feed on big screen for all those on the strip that could not get in. Packed house and Sammy Rocked it! With over 15,000 square feet, Cabo Wabo Cantina caters to endless private event opportunities while offering an array of entertainment services. Corporate events are welcome year around with visual and branding capabilities, such as three full service bars, state of the art lighting and sound systems, two built in stages and deejay booths. Custom Cabo Wabo gifting and merchandise is also available. Cabo Wabo Cantina has become a destiniation for smaller events as well, including Bachelor/Bachelorette dinners to Wedding, Bridal and Baby Showers. Private event space features floor to ceiling Strip-view windows, adedicated bar, full stage, deejayÂ setup and private restrooms. Private dining comfortably seats up to 140 people while offering space for up to 220 guests for standing receptions. The main dining room accommodates up to 320 seated guests, and the patio up to 150. Cabo Wabo Cantina offers opportunities for both full and partial buyouts for special events, both personal and corporate.